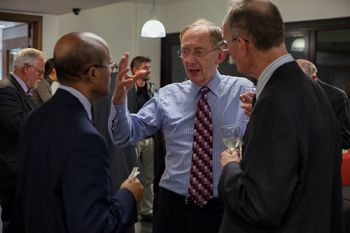 The 41st annual Edwards Lecture, delivered by Professor Sir John Pendry FRS on the 29th of October, offered a glimpse into the extraordinary future possibilities of metamaterials. 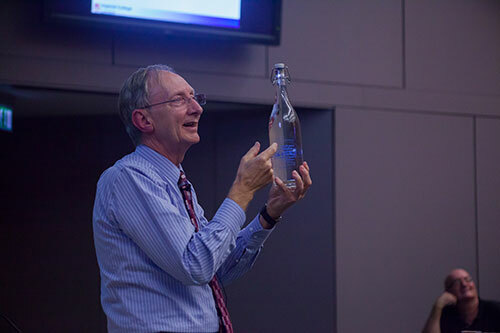 Professor Sir John Pendry, FRS, delivered the 41st annual Edwards Lecture - "Metamaterials & The Science of Invisibility" - on the 29th October in the Oliver Thompson Lecture Theatre. His lecture addressed recently discovered metamaterials which have created extraordinary possibilities through their negative refractive index and lenses whose resolution is limited only by the precision with which they can be manufactured. "We are going to hide an object behind a mirage, bending light around the object, just like a road mirage. We do this by grading the index of refraction in a cloak so as to bend the light by exactly the right amount. Ordinary materials like glass are not adequate for this task and we have had to invent a new class of materials, metamaterials, whose properties can be tailored virtually at will." 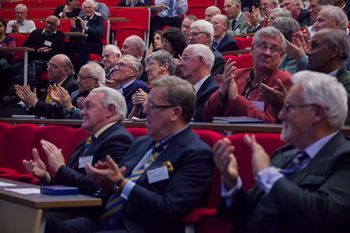 The annual Edwards lecture, sponsored by the City of London livery company, the Worshipful Company of Scientific Instrument Makers (WCSIM) commemorates the work of F.D. Edwards, who was a staff member at City's predecessor institution, the Northampton Institute. He was also a past member of the WCSIM. 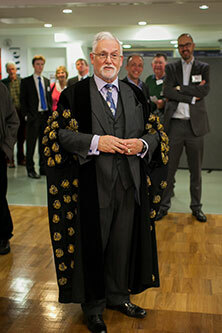 The evening also featured the ceremonial convening of the lecture by the WCSIM's Beadle, Tony Parker and a presentation of a souvenir medal to Professor Sir John Pendry, by Senior Warden, Christopher Sawyer.